The Eurogroup's statement says, “We also agreed that the IMF would continue to play its role”. Greece has given in on this point and the Troika continues to exist and be strongly involved in all but name. The tentative agreement also contemplates no debt reduction and, apparently, no change in the commitment to keep austerity measures intact. “The Greek authorities commit to refrain from any rollback of measures and unilateral changes to the policies and structural reforms that would negatively impact fiscal targets, economic recovery or financial stability, as assessed by the institutions,” the statement said. Signing this statement is a clear capitulation by Alexis Tsipras and Yanis Varoufakis. Greece shouldn't have surrendered to Germany’s bullying. 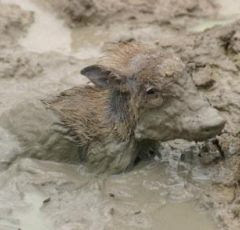 Every Mud Report on Greece has solutions in it, todays comes from Willem Buiter, chief economist of Citigroup, and John Cochrane of the University of Chicago who pointed out: "The Greek government could meet its domestic obligations, such as pension payments, by issuing tradeable IOUs that could also be used to make tax payments — in effect, creating a parallel currency. This virtual money could also be used for other purposes: for instance, to recapitalize ailing banks." Hope is a two edged 'thrill of victory, agony of defeat' kinda thing. It must have been a long trip home from Brussels for the well spoken Greek duo. Why not hope that they have printed billions of drachmas, it's a long weekend there, they could distribute them to the banks over the weekend and open the banks Tuesday chocked full of Drachmas, nary a Euro in sight... 1:1 exchange rate. 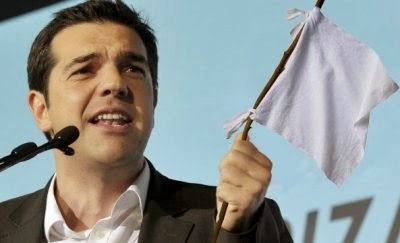 Stay tuned because if Syriza's media darlings don't make some huge surprise move that shows they are walking the talk i'd bet that in days they'll face a no confidence vote.